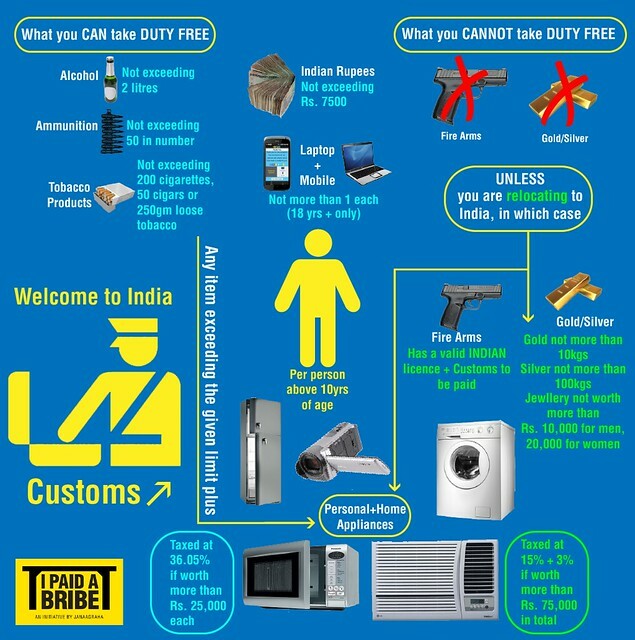 Every passenger entering or leaving the Indian borders has to pass through Customs check. The individual must fill up the Disembarkation Card in which the quantity and value of goods that he has brought are clearly mentioned. On the arrival, the passenger is first cleared by an Immigration Officer who retains the Immigration portion of the Disembarkation Card. Thereafter the passenger takes the delivery of his baggage from conveyer belts & passes through Customs. Like all other International Airports, the passenger has the option of seeking clearance through a Green Channel or through a Red Channel subject to the nature of goods being carried. (i) A Green Channel for passengers not having any dutiable goods. (ii) A Red Channel for passengers having dutiable goods. For private visits abroad, other than to Nepal and Bhutan, viz., for tourism purposes, etc., any resident can obtain foreign exchange up to an aggregate amount of USD 10,000, from an Authorised Dealer, in any one financial year, on self-declaration basis, irrespective of the number of visits undertaken during the year. This limit of USD 10,000 or its equivalent per financial year for private visits can also be availed of by a person who is availing of foreign exchange for travel abroad for any purposes, such as, for employment or immigration or studies. 8. Alcoholic drinks and tobacco products imported in excess of free allowance are chargeable to custom duty at the rates applicable to their commercial imports as per the Customs Tariff Act. 9. Import of Indian currency is prohibited. However, in the case of passengers normally residing in India who are returning from a visit abroad, Indian currency up to Rs. 7500 is allowed.